Anthony Berger of the Brady Studio, President Lincoln and his son Tad, February 9, 1864. In this lesson students study Alexander Gardner's photograph of Lincoln taken a little over two months before his death. They look for clues to Lincoln's personality and mood, read a short biography, write a poem describing what they learned about Lincoln, and create an artwork showing his character. They also learn about Civil War photographer Alexander Gardner and 19th century photographic processes. In 1865 artist Matthew Wilson was commissioned to paint Abraham Lincoln's portrait. 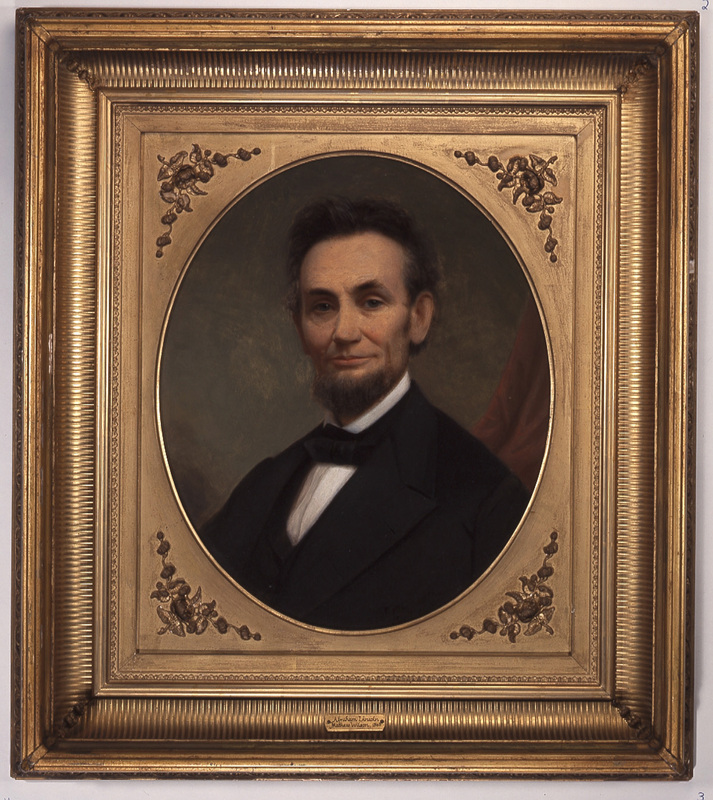 Ideally, he would have painted Lincoln from life, but in the middle of the Civil War, President Lincoln could not spare the hours required to pose for a painted portrait. Wilson would have to work mainly from recent photographs. On February 5, Lincoln, his 11 year-old son Tad, and Wilson visited Alexander Gardner’s photographic studio in Washington, D.C. When Alexander Gardner took this photograph, Lincoln sat motionless for several minutes except for his fingers which fidgeted with his glasses and a pencil. That Sunday, Gardner took five photographs including one of Tad and Lincoln at a table, this half-body portrait of Lincoln fiddling with his glasses and pencil, and a close up of Lincoln’s face.Wilson’s painting most resembles Gardner’s photograph showing a pleasant, smiling Lincoln rather than the haggard, tired Lincoln in most of the 1865 photographs. In this photograph, the 55 year-old Lincoln is visibly aged and thinner than in earlier photographs. In February 1865, at the time this photograph was taken, the country had been at war for almost four years. Lincoln was re-elected in November 1864; however, following the provisions of the Constitution, he was not inaugurated until the following March. (It was not until the XXth Amendment that the date of the inauguration was changed from March to January, thus shortening the window of the "lame duck" period. Learn more about this development at Inaugural History from the PBS Newshour). Alexander Gardner immigrated to the United States in 1856 from Ireland. He worked for Civil War photographer Mathew Brady as a photographer and studio manager. He often photographed Civil War soldiers in their new uniforms in Washington, D.C. before they left for the battlefront. Gardner also photographed Civil War battles and eventually set up his own photography studio. In Lincoln's lifetime, photography was still an innovative technology. As the first presidential candidate to use photography to make his face familiar to voters, Lincoln credited photographer Mathew Brady for getting him elected. Photography in 1865 was very different from the photographic medium we know today. Instead of film or digital technology to capture images, photographers used glass plates with huge cameras. Under a dark covering, the photographer coated a glass plate with a light-sensitive emulsion, inserted it into the camera, and exposed it to a well-lit subject (like Lincoln) for several minutes. In the dark the photographer developed this negative in a solution, and then a fixative to stabilize it. To print the photograph he placed the glass negative over paper coated with an albumen (egg white)/salt emulsion and silver nitrate, exposed these to light for a few minutes, and then applied chemicals to prevent fading. Learn more about this process at the American Experience Web site. Albumen prints have a very smooth, hard surface. Details are visible even in the darkest areas of these prints. Unlike earlier daguerreotypes, multiple copies of glass negatives could be printed on albumen/silver treated paper. Review the Picturing America Educator Resource Book information and activities for Alexander Gardner's Abraham Lincoln, February 5, 1865 photograph. Before discussing Gardner's Abraham Lincoln, February 5, 1865, have students study it individually and fill out The National Archives Photo Analysis Worksheet. Use the worksheet questions and the students' answers as a framework for a class discussion about the art. Encourage them to notice details that will help them understand Lincoln. People—Lincoln is the only person in this photograph. Ask students to note details about his body in the first column and clothing details in the objects column. Lincoln sits in a chair with his left arm resting on a table. He is still except for his fingers that hold a pencil and his glasses. Deep facial lines, hollows in his cheeks, and sadness about his eyes remind us of his responsibilities leading the country through years of bloody war. He looks tired. Perhaps he has not been sleeping or feeling well. Maybe he was sad about his son Willie's death. Gray hairs indicate his age, 55 years-old. His fingers holding the pencil and glasses are blurred. He moved them while he posed for this photograph. He needed glasses to read and the pencil to write. Perhaps he fidgets with these objects as he thinks of all he needs to do. His pocket-watch chain suggests that he's aware of passing time. With his tilted shoulders and arm resting on the table, he seems comfortable. He'd often posed for photographers, and these photographs were just to be studies for a finished, painted portrait. His slight smile might mean that he was enjoying his son Tad during this photo session; or maybe he had received good news from the battlefront. Why did Lincoln look so tired? Why is Lincoln dressed like this? Why is he holding a pencil and glasses? What was he smiling at? What did Lincoln write with the pencil? How did Lincoln look when he was younger? Why are there dark spots on this photograph? Why did Lincoln have to sit still so long for this photograph? What did type of camera was used to make this photograph? 2. Where could you find answers to these questions? Students could find the answers to their questions about Lincoln in biographies, on the Internet, in encyclopedias, and in their history textbooks. Encourage them to explore the suggested EDSITEment websites and resources at the end of this lesson to learn more about Lincoln, Alexander Gardner, and 19th century photography. Download and copy the attached biography and Guided Reading Questions. Have students read for understanding, stopping to answer the included questions. Ask students to think about how Lincoln's life experiences influenced him as a President. How might these experiences have effected what Alexander Gardner's lens captured? Download and print the "I Am" Poem template. After students have read the biography, they should then complete the poem as if they were Lincoln. Encourage students to think of unique words for their poem. Students may want to use a thesaurus or vocabulary words from English or another subject area to enhance their poem. When students have read about Lincoln and written their "I Am" poem, have them create their own multimedia portrait of Lincoln. They may follow downloaded and printed Making Portrait Directions. Students may use any size paper that they would like for their portrait. Teachers may change the rubric but should also encourage students to use three different media to create their portraits (for example, photographs, newspaper, string, wrapping paper, construction paper, cardboard, paint, pastels, colored pencils, markers, crayons, computer digitization, fabric, wallpaper, etc.). After students complete their portrait, they should write a few sentences explaining why they depicted Lincoln this way on the back of the portrait (or type their explanation and attach it to the portrait). Teacher and students may evaluate their portraits of Lincoln with the Making a Portrait Evaluation rubric. Lincoln portraits can be displayed in a "Hall of Lincoln" with the "labels" posted below the portraits. Students may try the EDSITEment Interactive of Alexander Gardner's February 5, 1865 photograph of Abraham Lincoln. Have students research and write the answer to one or two of their questions from the photograph analysis sheet in Activity 1. Students may compare photographs of Lincoln to photographs of 21st century presidents and politicians. They should analyze the backgrounds, clothing, objects, and activities in these photos to determine the message that they are trying to convey. For example, note how often politicians hold press conferences in front of flags, government buildings, and presidential seals. Help students understand the difference between today's photography process and that of the 19th century. Let them photograph each other in Lincoln's pose and then try sitting in that pose for three minutes. To understand why Gardner took only five photographs in this hour session, have them read Wet Plate Photography. Compare Alexander Gardner's 1863 portrait photographs of Abraham Lincoln to those he took on February 5, 1865. Notice how much thinner Lincoln looks. See Library of Congress. What evidence of Lincoln's personality and character as well as his struggles as president are revealed in Alexander Gardner's 1865 photograph?